Born to Be Posthumous, by Mark Dery, contains over 500 pages chock-a-block with Gorey's family, friends, fears and foibles. Not surprisingly, opinions are flying. In this corner The Comic Journal, and in this corner, the NY Times. If those weren't enough, read our review! We ask Mark Dery a few questions about writing Born to be Posthumous. Read our interview. 'There is only one thing in the world worse than being talked about, and that is not being talked about.' writes Oscar Wilde. Mad magazine published a revamped and sadly relevant version of 'The Gashlycrumb Tinies' this October. If you have children who have practiced 'Code Red' shelter-in-place drills in school, this says it all. Read about it in the NY Times. James Edwards, from the Department of Art + Design, University of Massachusets Dartmouth, College of Visual and Performing Arts, has received national attention from Hyperallergic Magazine for his exhibition, "E" is for Elephants, the Etchings of Edward Gorey, and is listed as one of the top 20 exhibitions in America for 2017. See the entire list then read the UMass announcement. A worthy question. To facilitate a worthy answer, Pomegranate has Edward Gorey: His Book Cover Art & Design. Visit Amazon or peek at Pomegranate's sample pages, then read our review. NPR's All Things Considered co-hosts Linda Wertheimer and Noah Adams lovingly recite The Gashlycrumb Tinies from NPR's Edward Gorey obituary page on April 17,2000. A nice interview with Andreas Brown included, in Real Media format. See what else NPR Radio produced about Edward Gorey. PBS & WGBH presents Mystery! The official PBS Mystery! site [now archived], with a 1996 Gorey interview by Ron Miller. Derek Lamb writes about Gorey's collaboration for the legendary Mystery! animations. And finally a tribute by Animation World magazine to Derek Lamb [1936-2005] which mentions the animation collaboration. Housing the largest Gorey collection in Japan, the two Wonderful World of Edward Gorey websites are the creations of Toshinobu Hamanaka. The book by the same name, edited by Mr. Hamanaka, and published by Kawade Shobo in 2002, is a beautiful volume. In Japanese. What the Doubtful Guest does on stage is everybodys business in Hoipolloi & Theatre Royal Plymouth's production, which ran March 13 thru April 12, 2008. From London, the company toured Liverpool, Ipswitch, then Newcastle. The show was met with enthusiasm from both The Times and The Guardian -- "...a piece of visual theatre that captures all the Victorian pastiche, fantastical imagination and ominous air of Gorey's original." - Lyn Gardner, The Guardian. Hoipolloi Artistic Director ShÃ´n Dale-Jones discovered 'Doubtful' while touring the US in 2005. "I went into a childrenâ€™s bookstore to look for one of Edward Lear's titles, but couldnâ€™t find one. The clerk asked if he was the guy Edward Gorey did some illustrations for. She handed me a collection of Goreyâ€™s books â€“ including Learâ€™s The Jumblies. Before I knew it I had looked through the whole book and was asking the shop attendant for more Edward Gorey...by the time I left the USA later that month Iâ€™d bought every title I could find in every bookstore I walked into. On the plane journey home I kept returning to The Doubtful Guest and got hooked on the world of this illustrated story." Visit Hoipolloi's blog for some snapshots of this memorable production. Gorey's residence in Yarmouth Port is now a museum. It's mission: "The Edward Gorey House celebrates and preserves the life and works of Edward Gorey...[and] honors Gorey's passion and concern for animals, raising awareness about local and national animal welfare issues." Gorey's favorite yellow sweater, greatcoat and tennies are on view as well. Minneapolis's own Irwin Terry hosts the Goreyana blog, diligently posting interesting Gorey artwork from his collection, with excellent photos. Talk amongst yourselves! Antiquariat Bucherwelten provides unparalled access to translated editions, brought to you by Jonas Ploger. Located in Germany. In English and German. TrueType font based on the distinctive hand lettering from many of Gorey's books. From Damian Hess, it's quite a delicious, no-cost treat. OgdredWeary by nonDairy Fonts. Complete your collection of Edward Gorey fonts with another no-cost TrueType or MacFont font, inspired by Gorey's The Curious Sofa. "First you're born, you live a little, and then you die..." To that end, the FCA is here to help, with Gorey's Osbick Bird gracing a handy end-of-life planning kit. Available in spiral bound or PDF download by state. Embrace the inevitable. 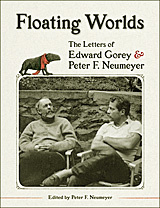 A comprehensive bibliography of Gorey's works. Photographs and text by Kevin McDermott, sheds new light on Mr. Gorey through his residence, now museum, (a.k.a. 'The Elephant House') in Yarmouth Port. Fifteen etchings and lithos are reproduced. Introduction by John Updike. Published by Pomegranate, Elephant House is in it's 2nd printing. Goreyography talks to Kevin about the making of Elephant House. Finally, read our review of Elephant House. Visit McDermott's Lost Gotham, an evocative journey back to both the Gotham Book Marts before it finally closed in 2006. Five years in the shooting, film maker Christopher Seufert of Mooncusser Productions has produced several award-winning films, and with Kickstarter funding, is working to complete his most challenging project. Visit Seufert's Facebook page to read the latest updates about this most fascinating project. A voyeuristic view of Gorey's studio as it stood in Yarmouth Port before it was tidied up after his death in 2000. Viewer plugin required and may take some time to load. Worth the wait. inductee into its 2012 Hall of Fame, joining the likes of N.C. Wyeth (1974), Ludwig Bemelmens (2012), Maxfield Parrish and Howard Pyle (1975), and Charles Schulz (2013). The original treatment: "A charming mischievous creature shows up at a family-owned bed & breakfast, and turns the funny family's life upside down." The concept, first announced 2007 by Jim Hensen Company, will hopefully make it to the projection room. It's a lovely idea, after all. See how Siobhan Magnus, is always an EGH star! Paint it Black Siobhan!